Sky is adamant that users of their base level broadband package can get a decent experience out of the forthcoming Sky Anytime+ VOD service, despite the data cap meaning that people could be charged extra for watching more than 180 minutes of television a month. Anytime+ is Sky's forthcoming video on demand through a broadband connection, which will only be available to people on Sky's broadband packages. 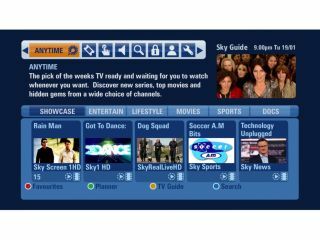 Sky's most popular broadband package is its well received unlimited package – but for those people on Sky Broadband Lite, its entry level offering, the arrival of Anytime+ could be a rude awakening. The 2GB data limit would restrict viewing severely by being included along with any other form of internet traffic, a different approach to the likes of BT Vision and Virgin Media, neither of which includes VOD usage in its limit. As a point of clarity, it should be pointed out that Sky's existing push VOD Anytime does NOT count towards any data limit. Although the company will face criticism of trying to 'upsell' people onto the more expensive broadband package, Sky's Kathryn Downward insisted that excluding the base level was not considered a good idea. "Customers [on Sky Broadband Lite] will be able to enjoy a decent amount within a month with that limit," she told TechRadar. "But if you want to watch everything in our library then we would of course recommend the unlimited option." Downward, who insisted that locking the service to unlimited broadband subscribers would be wrong. "We didn't want to limit it," she said, "that would be excluding people who only want to watch a couple of items. "[The Sky Broadband Lite package] still allows people to get a taster of the Anytime+ product, letting everybody try it and adapt their viewing accordingly." When asked as to why Sky is not offering, like BT, to exclude IPTV traffic from the internet usage, Downward told TechRadar that she believed that could be confusing for customers. "To us any internet usage is still internet usage – however it's being delivered", said Downward. "If we did [differentiate between Anytime+ data and normal internet use] it could be confusing between what isn't and what is." Downward also made it clear that customers who sign up for Anytime+ and are on the Lite package would be warned about how much IPTV they can consume before they hit their cap, and that anyone with Anytime+ that does exceed the cap will be reminded that the new service could be contributing to their data usage. "We are standing by what we are doing and we believe that we are offering a good service," she concluded. In fairness to Sky, its unlimited package – when taken in conjunction with its television package – remains one of the most attractive options on the DSL market.